It's the last hurrah for Olympic athletes and their supporters in Brazil. The 2016 Rio Summer Olympics Games come to an end with the Closing Ceremony this Sunday in Maracana Stadium. The United States has a lot to celebrate in the Closing Ceremony after the performance its athletes gave over the last few weeks, particularly the USA Swimming Team. 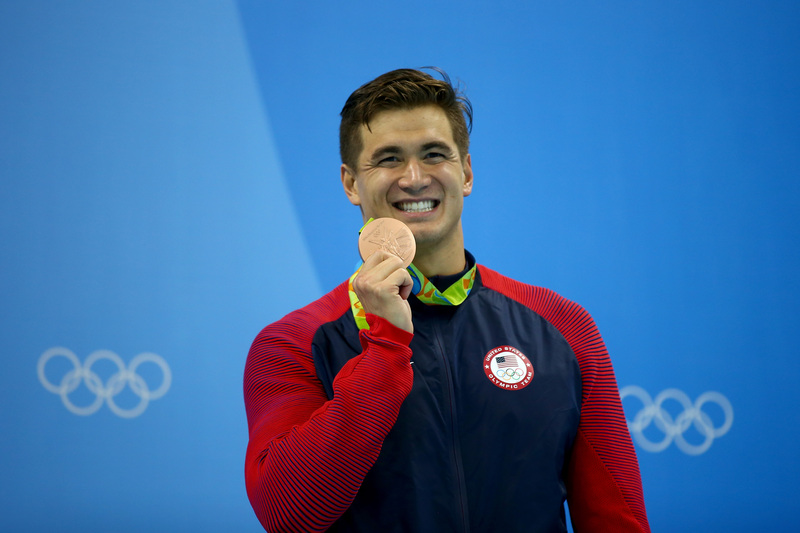 Rio marked 27-year-old Nathan Adrian's third trip to the Olympics with Team USA. He also competed in Beijing in 2008 and London in 2012. So did the competitor show out to celebrate his successes in Rio with the rest of his teammates? Adrian hasn't been featured during the live broadcast of the closing ceremony, and, after such an intense Olympic experience, it's totally understandable. When I watch the Olympics, I can't help but think about the hours, weeks, and years spent training for competitions that are over in mere minutes and sometimes decided by mere fractions of a second. It's high stakes and high pressure in the Olympic pool, but when Adrian was caught by NBC's cameras, he was usually smiling. And why wouldn't he be? Adrian is headed back to the States with four Olympic medals to add to his collection. (A gold from Beijing; two golds and one silver from London.) Not bad for a life's work. Adrian secured a bronze in the 100m free behind Australia's Kyle Chalmers and Pieter Timmers from Belgium. He also touched the wall third in the 50m free. That race was owned by Adrian's tattooed teammate Anthony Ervin, with Florent Manaudou from France taking silver. Both of Adrian's Rio golds were the result of the pure aquatic teamwork. On Day 2, he won the 4x100m freestyle relay, sharing the podium with Ryan Held, Caeleb Dressel, and the most decorated Olympian of all time, Michael Phelps. Day 8 brought another gold in the 4x100m medley relay. Ryan Murphy, Cody Miller, Phelps, and Adrian clocked in at 3:27.95, setting an Olympic record. Adrian was the anchor swimmer on both of those first place relay teams. Immediately after the victory in the medley, he told NBC Sports, "that's a position that I love" and that "nothing pumps [him] up more" than seeing his teammates eke out a lead that he can maintain. While Phelps confirmed to NBC Sports that he's for sure retiring this time and is "ready for something different," Adrian is already looking towards his swimming future. In an interview with the Fox 43 station in Central Pennsylvania, the athlete says, "The Olympics comes every four years but really the goal-setting and figure out how we're gonna make process for Tokyo in 2020 starts now." It looks like Nathan Adrian hasn't lost that Olympic hunger yet and fans will likely be watching him winning medals, cheering on teammates, and representing the USA four years from now. Even if they're not particularly watching him at the Closing Ceremony.